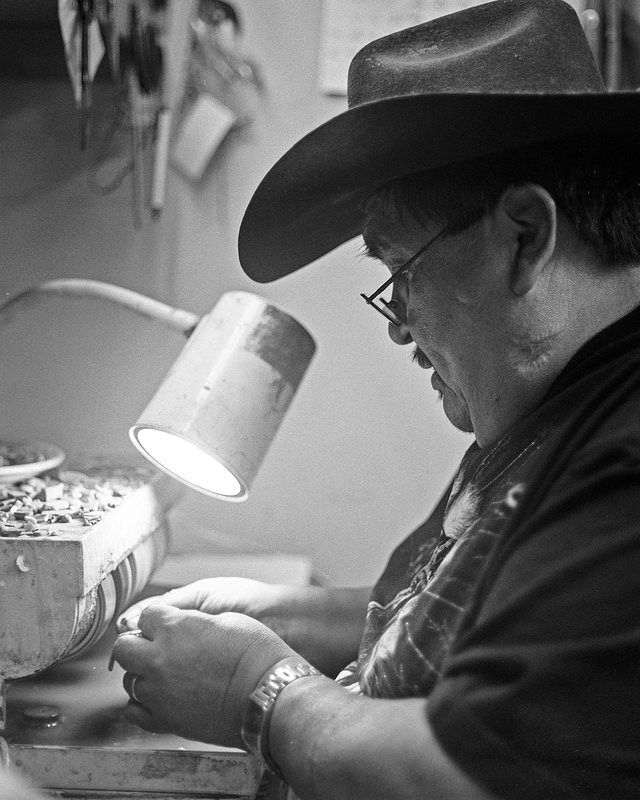 What is the best way to ensure that you’re getting what you’re paying for when it comes to Native American jewelry? I ran across an article in Arizona Highways that suggested, “Buy your Indian jewelry as well as all other Indian arts and crafts, from a reliable dealer”. Believe it or not, that article was written in 1939. Nothing has changed! When purchasing from a dealer, choose one with a good reputation. Request a written guarantee or written verification of authenticity. Get a receipt that includes all the vital information about your purchase, including price, maker, and maker’s Tribal affiliation. Familiarize yourself with the different materials and types of American Indian arts and crafts, as well as the indicators of a well-made, handcrafted piece . Realize that authentic handmade pieces may be expensive. If a price seems too good to be true, be sure to ask more questions about the item and its maker. A reliable dealer will be able to offer information and guarantees for your purchase and will be happy to back them up. Some sellers offer a “certificate of authenticity”. Keep in mind that, unless the certificate originates from and is signed by either the artist who created the art, a confirmed established agent of that artist (not a casual third party or reseller), or an acknowledged expert on that artist, the certificate might be meaningless. Look for a guarantee – that way you can recoup your investment if you later find the information was inaccurate. Work with sellers who have a strong, stable history in their location – people you’ll be able to find easily should you need to contact them. Buying from fairs, sidewalks, or parking lots can be fun and charming, but it’s entirely possible you won’t be getting what you hope you are – and you’ll have little recourse. Ask questions and know what you want – you’ll do just fine! This entry was posted in Buying Native American Jewelry. Bookmark the permalink. Hello Kelly & Denise. Best regards from Shirley & Laurence Adler in Virginia. Miss dropping in to say hello and, of course, buying some jewelry that we really don’t need. But who can refuse buying something from all the beautiful items in the store? We are doing fine. All’s well. Virginia is a beautiful state and we’re getting accustomed to living here. But, of course, we miss Arizona a lot. Hope all’s well with you both. Who knows. Maybe one day we may surprise you both and walk in the front door. Here is our e-mail address— Lash895 @aol.com—would love to hear from you. This is a great article about buying Native American jewelry. It’s my wife’s birthday next week, and I think she will love this as a birthday present. I like your suggestion of purchasing from a dealer with a good reputation. I’ll also ask for a written guarantee of authenticity as per your advice. I imagine I’ll get more information and designs from a reliable dealer.